Achilles tendinitis is an over use injury of the Achilles tendon, the band of tissue that connects calf muscles at the back of the lower leg to your heel bone. Achilles tendinitis most commonly occurs in runners who have suddenly increased the intensity or duration of their runs. It’s also common in middle-aged people who play sports, such as tennis or basketball, only on the weekends. Most cases of Achilles tendinitis can be treated with relatively simple, at-home care under your doctor’s supervision. Self-care strategies are usually necessary to prevent recurring episodes. 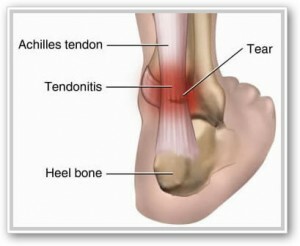 More-serious cases of Achilles tendinitis can lead to tendon tears (ruptures) that may require surgical repair. The pain associated with Achilles tendinitis typically begins as a mild ache in the back of the leg or above the heel after running or other sports activity. Episodes of more-severe pain may occur after prolonged running, stair climbing or sprinting. You might also experience tenderness or stiffness, especially in the morning, which usually improves with mild activity. Achilles tendinitis is caused by repetitive or intense strain on the Achilles tendon, the band of tissue that connects your calf muscles to your heel bone. This tendon is used when you walk, run, jump or push up on your toes. The structure of the Achilles tendon weakens with age, which can make it more susceptible to injury — particularly in people who may participate in sports only on the weekends or who have suddenly increased the intensity of their running programs.